This impressive inflatable fits in a large suitcase and deploys to be 12ft tall by 16ft long in a less than 2 minutes. 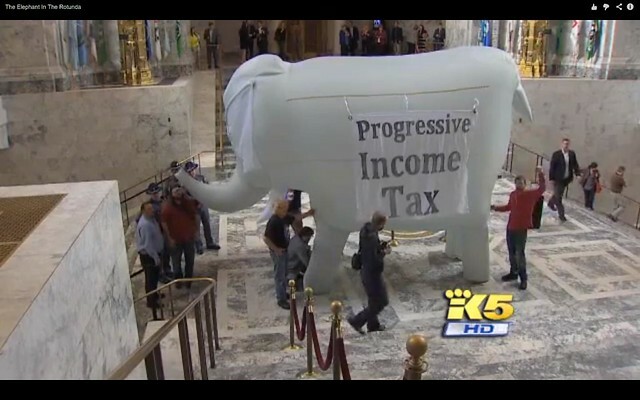 Rent or borrow this prop to point out in a big a way the Elephant in the Room issue that no one is talking about. If an injustice and the voices pushing the issue have been ignored for far too long, make it near impossible for your targets to not to address this Elephant in the Room. Replace the velcro banners on the side with your own message. With a little rehearsal, some stealthiness and bravado you can definitely give your campaign the media attention the issue deserves. Fill out the form below to rent or borrow the Elephant in the Room prop for your actions!